I set out to tackle GITAP 2016. And survived. Not only did I survive the annual GITAP, I had a great time throughout the ride. The six day GITAP ride is a fundraiser for Ride Illinois, a bicycling advocacy group. Four weeks ago, 10 miles was a long cycle ride for me. My perspective changed very quickly. My training miles were less than ideal as the the ride date approached. 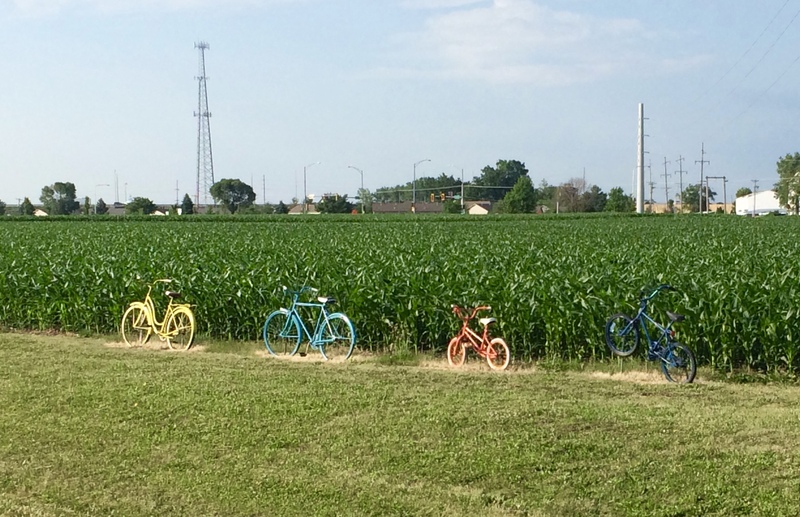 About 4 weeks before the start, I heard about the Schaumburg Bicycle Club. I enjoyed a couple of 20 mile rides with the club led by Lynn. On one of these rides, Roger, a more experienced cyclist recommended I get a rearview mirror which proved to be valuable safety measure. A 25 mile ride on my own and the 51 mile Udder ride rounded out my training for the month before the GITAP. Besides Roger, Wayne, Karen and Lynn were also helpful and shared their best tips for a successful ride. With their support and lots of pedaling, I biked the entire GITAP 2016 route. I achieved my goal for this week to complete GITAP 2016 route without SAG (support and gear.) SAG volunteers monitor the route to pick up bikes and cyclists unable to complete their ride that day. I picked up my registration packet, loaded my luggage on the truck then set off on my bike early in the morning. Today would be the longest bike ride I ever rode. Headwinds were a challenge for the first 13 miles. 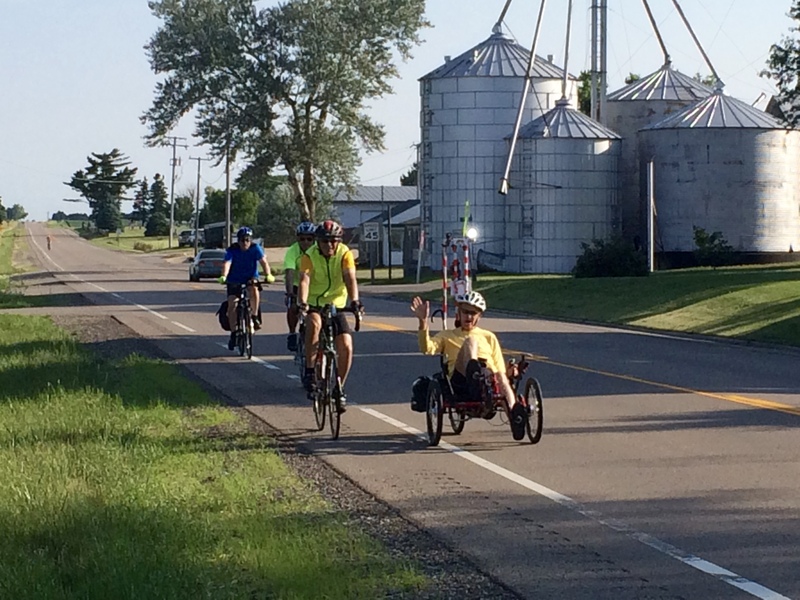 Just as I approached the Illinois and Michigan Canal Trail, I met up with another GITAP rider Kent. We rode together for most of the next six days. The I & M Canal trail is mostly packed limestone with the rest a combination of grass, packed dirt, loose gravel and a few spots of sand. The best parts of the trail were shade, shelter from the wind and no auto traffic. About the 26 mile mark we ran into Wayne and Chris and rode with them the rest of the day. We stopped in Ottawa for lunch. Our ride took us up to the locks across from Starved Rock. The last 5 miles were hilly compared to the relatively flat road the rest of the day. Dinner at the Lehigh Park campground with entertainment by the Henry Torpedo Boys and the nightly meeting about the next day’s ride. DAY 2. Oglesby to Washington. Again, today would be the longest bike ride I ever rode. It was also our longest day of GITAP. Mostly country roads, lots of corn and soybeans with a steady rise in elevation, rolling hills with a few bigger hills. Temps were 95, high humidity and 11 MPH headwinds. I realized about 1/2 way through the day I was not drinking enough water. SAG brought in many riders today. 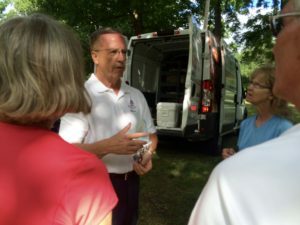 We were warmly greeted by Washington Mayor Gary Manier and Assistant Superintendent of Washington Community High School Joe Sander who emphasized their appreciation for the outpouring of support after the town was hit by a EF4 tornado. The folks at Russell Fitness helped me replace my broken gloves. My ride felt much harder today and I noticed I felt thirsty starting out. Temps in the mid 90’s really drained me. 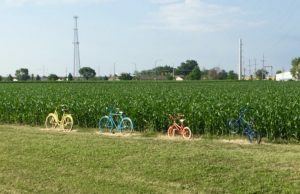 Loved the rainbow of painted bikes along the in Milton and the entire town of Mackinaw came out to welcome us at the top of the Mackinaw River valley. They were a site for sore eyes with rest rooms, water, fresh fruit, cookies and a warm welcome. Another 95° day with high humidity. At breakfast I ran into Normal with a fellow rider for geocaching and lunch. Heading up the Constitution Trail, we cached our way into town then met Kent for lunch at Flattop Grill. On our way back we pick up a few more geocaches. Amazing how short a 24 mile ride seemed. Today’s ride mostly north and east. Strong headwinds from the north at 14 MPH plus gusts. Cycling in farmland, the wind is relentless. With partly cloudy skies temps remained in the 80’s. After the ride I heading into town to see the The Pontiac Museum. Their Pontiac auto memorabilia includes cars and a large collection of hood ornaments. We stopped at the Route 66 Museum and saw the VW bus owned by artist Route 66 evangelist Bob Waldmire. Did you know actor Bobby Troup penned “Get Your Kicks on Route 66” while driving along the route to Los Angeles? Part of our ride today took us on the pavement of the original Route 66. The Gilded Arts Museum displayed tools and explained the techniques on this art. We learned an ounce of gold was more than enough to cover the museum floor with gild. The city of Pontiac hung out a huge welcome sign and Pontiac Mayor Bob Russell of greeted individually as we waited in line for dinner presenting each of us with a with a small gift. We caught the Vermillion Players opening night of “Legally Blonde” musical with the entire cast aged 16-25. Great job. Pontiac Mayor Bob Russell of greeted individually as we waited in line for dinner presenting each of us with a with a small gift. Today’s ride took us back in time along many miles of Historic Route 66, the Mother Road. 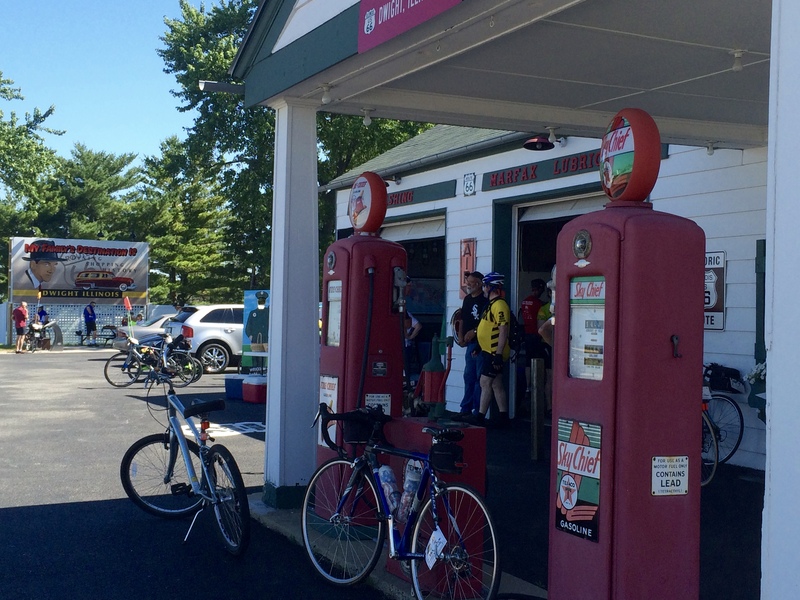 Our first rest stop was the restored Standard Oil Gas Station in Odell. The rest of the day was not as hot, mid 80s and flat. Another day of corn fields and soybeans for miles on end with a few wind turbines thrown in for variety. While the mileage was not as high as other days, my energy level was beginning to wear. Our route took us along various sections of Route 66 including the Dixon Information Center housed in an restored gas station. The volunteers were out in force with cold water, fruit and granola bars for us. A welcome site! Built in 1933, Ambler’s Texaco Station is not the Dwight, IL info center which welcomed us with cold water, fruit and granola bars! I was glad to pull into the parking lot, collect my bags and head home. My first GITAP was a success and a ton of fun. I met friendly people and enjoyed my week in small town America. Ride on!